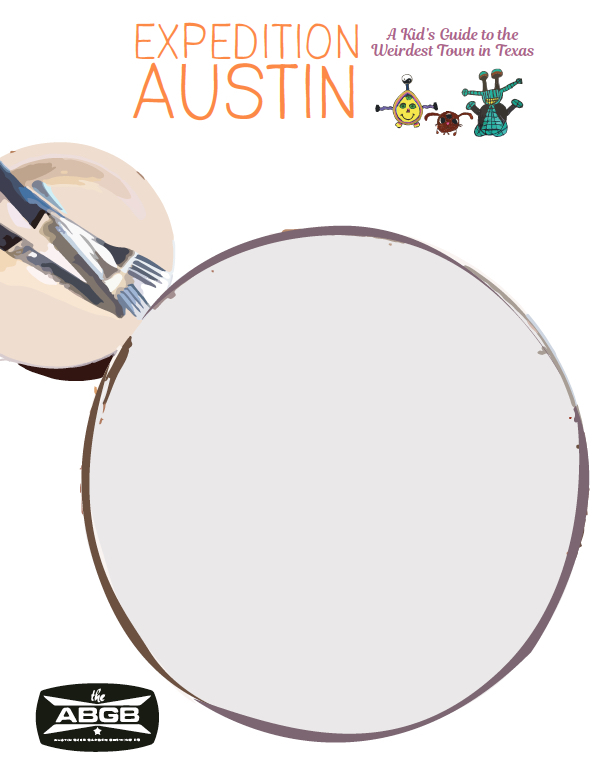 Austin City Limits Festival is right around the corner, which means it’s time to make the perfect totem! 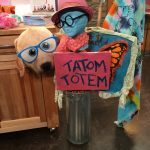 If you have big totem dreams but little inspiration, watch this short segment for some how-to tips on KXAN’s Studio 512. If you just want to get to it, print our handy how-to page or read some written tips. Have fun…we’ll see you (and your totem) down at Zilker Park! 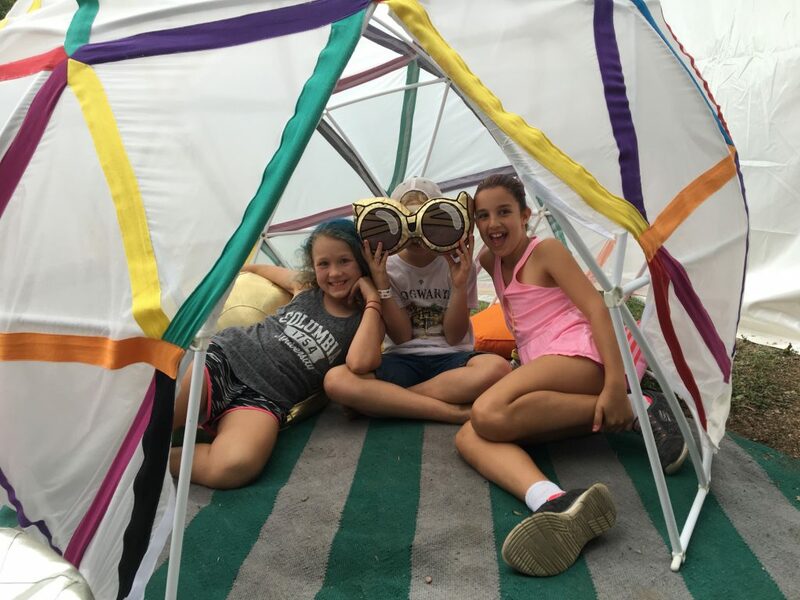 The kids loved making a totem for ACL Fest last year, so this year I wanted to try and spread the fun through KXAN’s Studio 512. If you don’t know what a totem is, it’s basically a long stick with something fun and festive attached to the top. 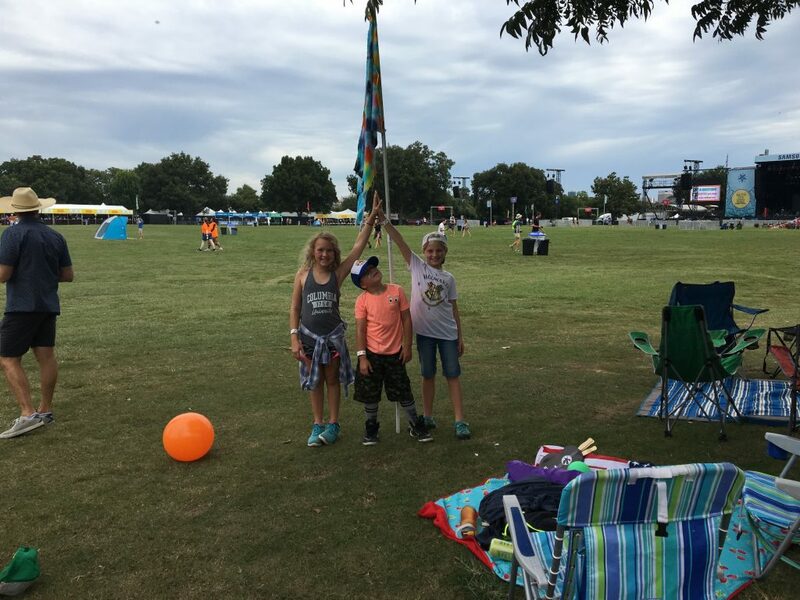 They come in very handy in big crowds like the one down in Zilker Park during ACL, and the kids love marching around with it, and planting it at our camp. There are many ways to go about it, like simply poking a hole through a funny puppy pillow; attaching a flag to a PVC pipe; printing out a giant monarch butterfly, painting it and attaching it to a canvas; or building a crazy blue-headed lady with a slogan attached. We’ve created a “How to Make an ACL Fest Totem” document with simple instructions on how you and the kids can make your own family totem. Good luck and have fun! 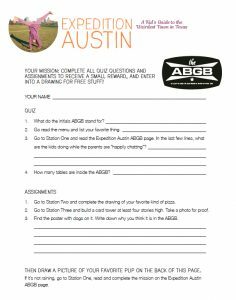 These are just a handful of activities listed on the Austin Summer Fun web site, so be sure and poke around! School’s (Nearly) Out for Summer! Cue Alice Cooper, because summer is upon us. It can be a bittersweet time as kids move on from elementary to middle school or from pre-k into the kindergarten big leagues. Mostly, though, it’s FUN…sno-cones and swimming pools and sleepovers and fireflies and camp and grandparent visits and…and…and…then what? In Austin, summer break lasts about 80 days and, at times, it can be daunting to try and figure out how to fill those 1,920 hours. 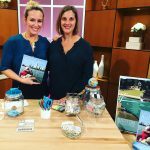 Today, I got to visit with Amanda Tatom at KXAN’s Studio 512 and talk a little bit about how Expedition Austin can help turn a day at the park into an experience at the park. 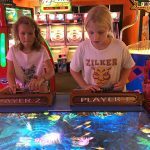 For example, cooling off at Barton Springs is always a good idea, but if your kids can learn a little about its history, know where to search for a Barton Creek Salamander, color in an illustration AND complete a mission, well, that there is several hours of fun and kid-approved learning. 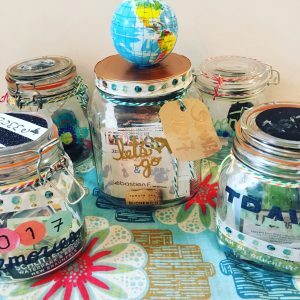 In addition to talking about our book, I brought in some fun memory jars that would make a great project to do with kids at the beginning of summer. 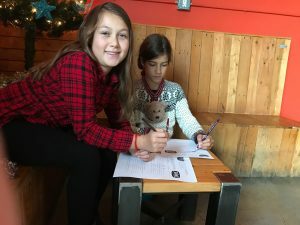 The idea is that your kids drop in mementos like ice cream spoons, ticket stubs, wrist bands, heart-shaped rocks, friendship pins, photos…anything that is meaningful to them from their experiences around town or on vacation. At the end of the summer, you’ll have a collection of treasures to revisit long after school is back in session. Finally, I told Amanda about a really fun event I’ll be part of on June 10: The LiveMom.com Summer Fun Checklist Launch. A fun event for the whole family, the launch will take place at Whole Foods on North Lamar from 9-12. More information is coming soon, but if you’ve never used the checklist before, it’s a really cool resource to help fill some of those hours. More info on that event coming soon! 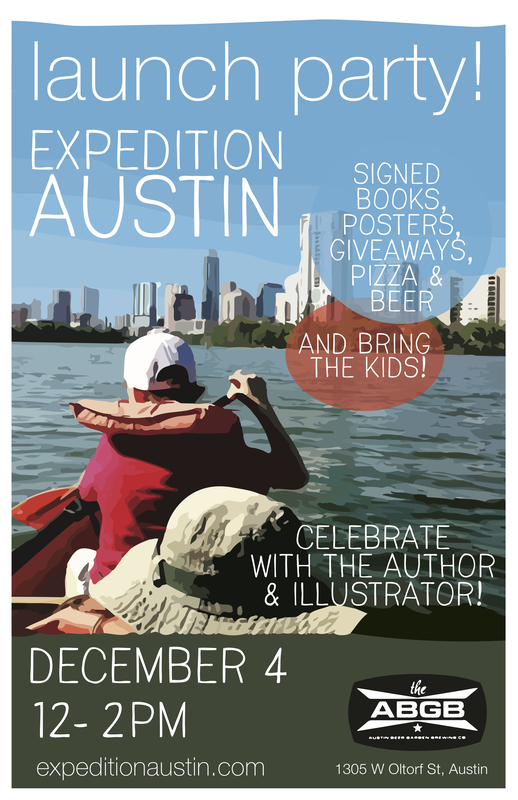 Expedition Austin is Officially Launched! 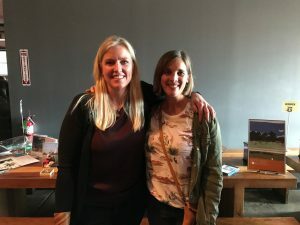 We had such a fabulous launch party at The ABGB! 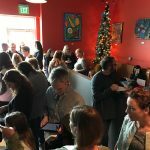 It was a wonderful celebration of a year of hard but rewarding work and our little labor of love. The weather was cold and rainy, so we brought the fun inside, and the kids had a good time completing this special made-for-indoors mission. 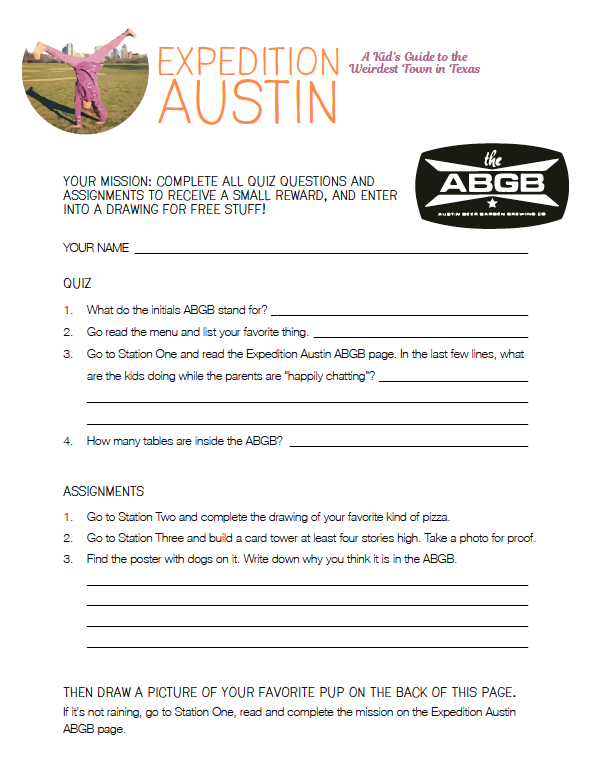 Next time you go to ABGB, print it out –you’ll also need to bring some colored pencils or crayons and a deck of cards! Virginia and I are so grateful to friends old and new for coming out and supporting us. 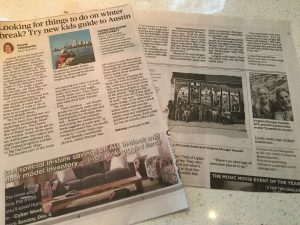 We were also very grateful to many locations highlighted in our book for donating fun party swag (Jim-Jim’s, Lucy’s Fried Chicken, Blanton Museum Shop, the LBJ Store, The Rowing Dock, Laguna Gloria and P. Terry’s), to the awesome ABGB for letting us hold our celebration there, and for some very exciting coverage in the Austin American Statesman and on 365thingsaustin.com. We’re still reveling in the local love and support! Thanks, friends! 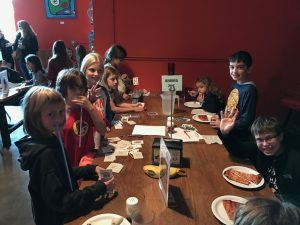 Kids working to fulfill their mission while munching on delicious pizza! More cute kids on a mission. 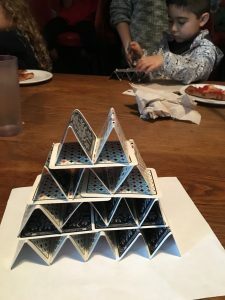 Build a house of cards, four stories tall: check! Virginia and Jill, the happy illustrator and author. 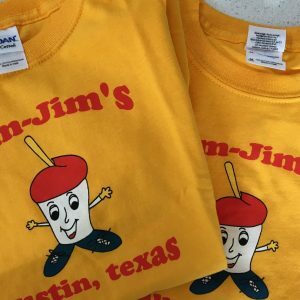 Super cute tees that Jim-Jim’s donated to the party. Happy F-1 week to all of you racing fans! Fast cars, glorious weather, Taylor Swift, plus Usher with The Roots (since The Weeknd cancelled) add up to what is bound to be a pretty awesome time. 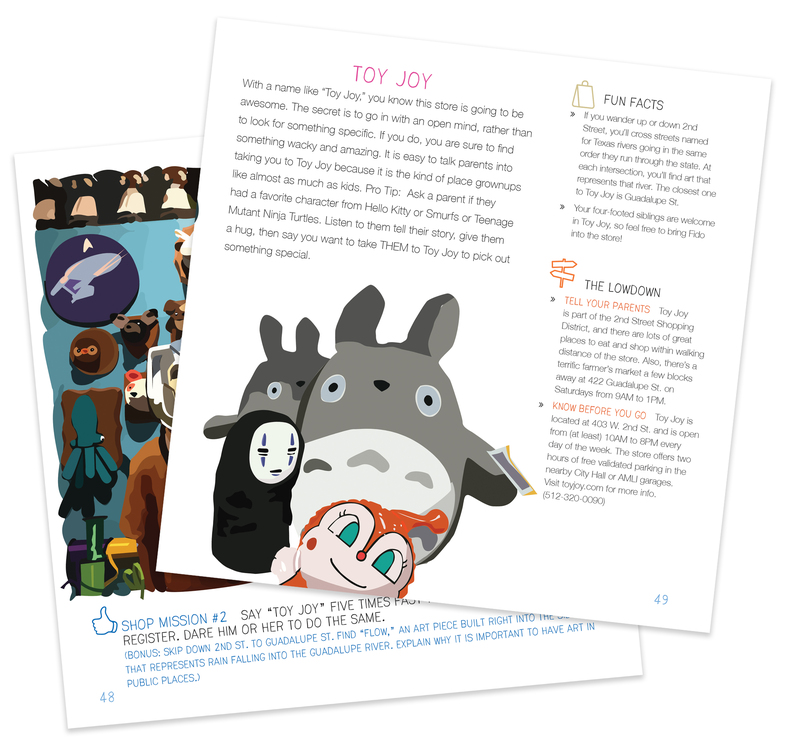 If you’re coming with kids, there’s a super-cute spread on F-1 in our Wristbands chapter complete with a mission to accomplish, fun facts, practical tips and a fun activity. 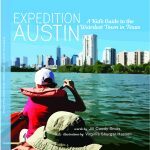 Pick up a copy of Expedition Austin in one of several retailers around town, or order one through the site. We’d love to see your F-1 adventures throughout the weekend on Instagram (#ExpeditionAustin), as well! 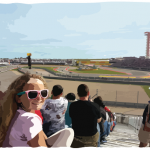 For another useful set of tips on how to do F-1 with kids, read this brief article by my friend, Amy Spiro. As you’ll see, her photo inspired the illustration in our book. 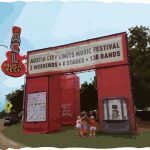 Austin City Limits Music Festival With Kids? Yes! 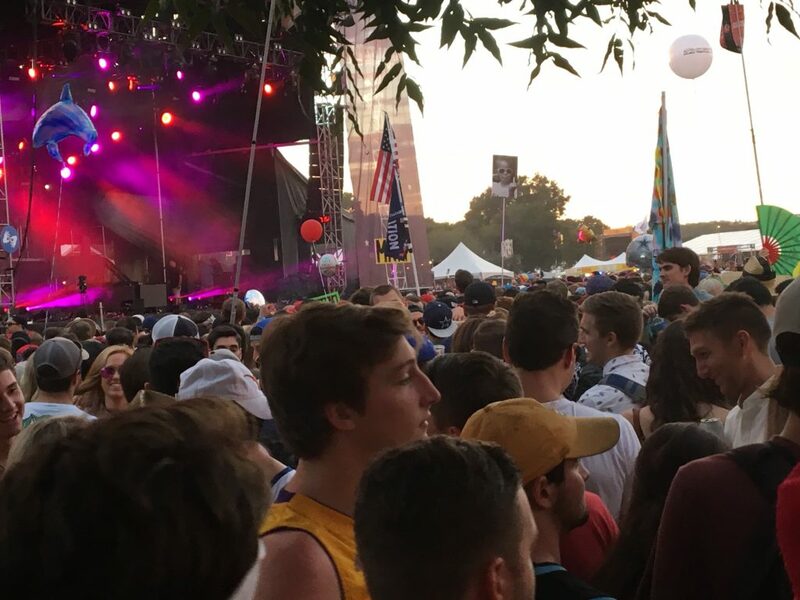 There are many different galaxies colliding in the Austin City Limits Festival universe. Among them, the nimble hipsters, the teenaged freedom tasters, the parked oldsters and us–the kidsters. 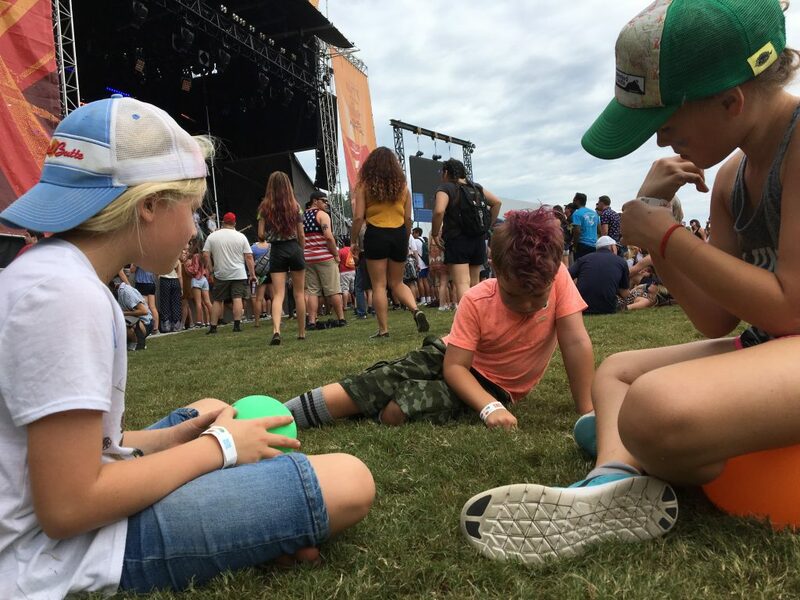 In our galaxy, the adults are there for music and craft beer, while the young ones may be more interested in sno-cones, beach balls and doing kid stuff in a world made, in large part, for people over 13 years old. 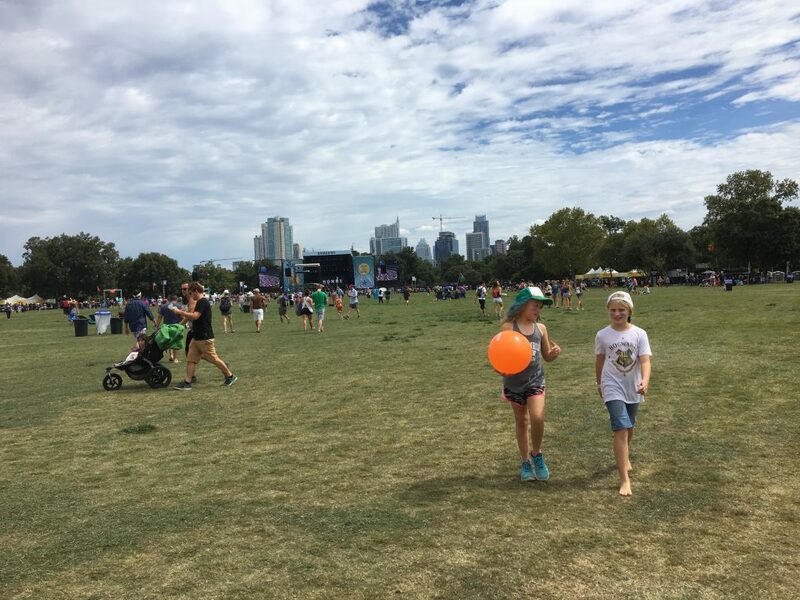 Expedition Austin includes lot of helpful info and logistics, but here’s some more good stuff to tuck in your pocket so everyone in your own kidster galaxy will have a great time at ACL. Go early, bring a small ball, water bottles and coparents, and set up camp. Our group included two families, and we set up just outside Austin Kiddie Limits around noon. When the kids got tired, it gave them and one adult somewhere to chill out while the other grownups were wandering around. We had books, cards and balls and the kids were into all of it at some point. Austin Kiddie Limits is awesome. 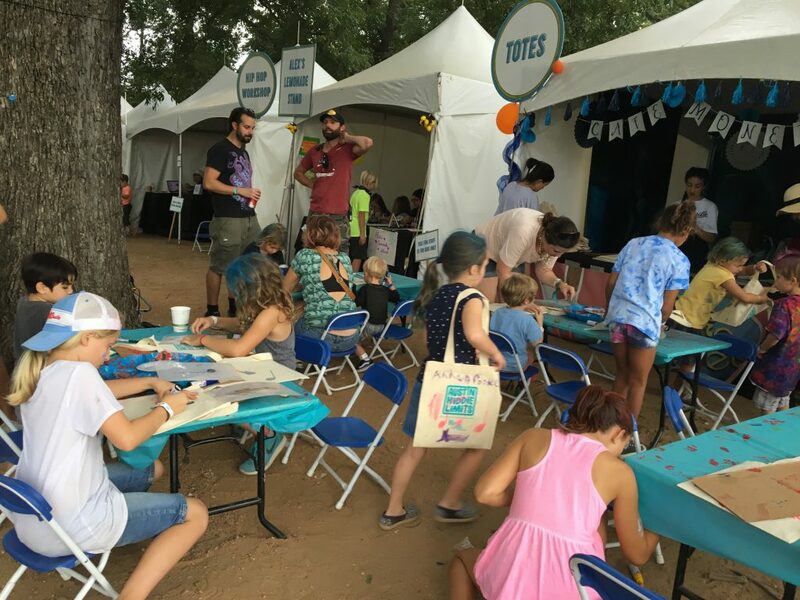 What with its tattoos, punk rock hair-dos, tote bag station, cleanish port-a-potties and adorable Land of Nod lounge area, this area really is cool–especially since it’s geared for folks who don’t have to pay to get into ACL at all. 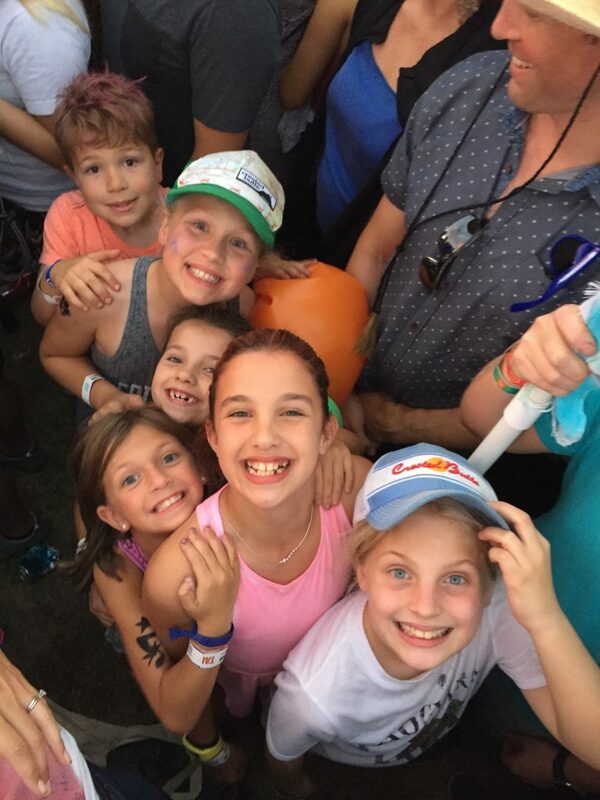 Our group of kids ranged from 6-10 years old and they all enjoyed aspects of the fest-within-a-fest, though the younger ones spent more time and participated in more activities than the older ones. Know that you (and your kids) will walk. A lot. Zilker Park is not a small place, and we logged about 18,000 steps in one day. The kids were along for about 12,000 of those, plus they played run-and-catch for a good deal of the time they were chilling at our base camp. Plan accordingly. While we got to ACL around noon (and entered through the awesome special family entrance), I really wish we’d gotten there closer to 11 because we had the run of the place until mid-afternoon. On the flip side, we left around 7:30 and I really wish we’d gone out the Austin Kiddie Limits family entrance before it closed at 7:00. One of the kids in our group really wanted to see The Chainsmokers at 7:30. You can just see our flag in the upper right of the photo above, and then one below of the kids in the midst of that crowd. When we realized how much the crowd was pressing in, we got them out, but by then we had to take a long, circuitous route around the huge crowd to the main gate. While you can’t do exactly what you want to do at ACL while a card-carrying member of the kidster galaxy, it’s pretty awesome anyway. You may miss out on a few bands and watch LL Cool J from the comfort of an inflatable sofa, but you’ll get to spend some q-t with little citizens of the world like these. We loved the ACL cashless option. Don’t forget to register your under-10s at the Tag-a-Kid booth. The kids LOVED making and carrying around our rage stick made from an old some sheet and PVC pipe. Drill a few holes in the pipe and tie on your flag with some heavy-duty string. Voila! 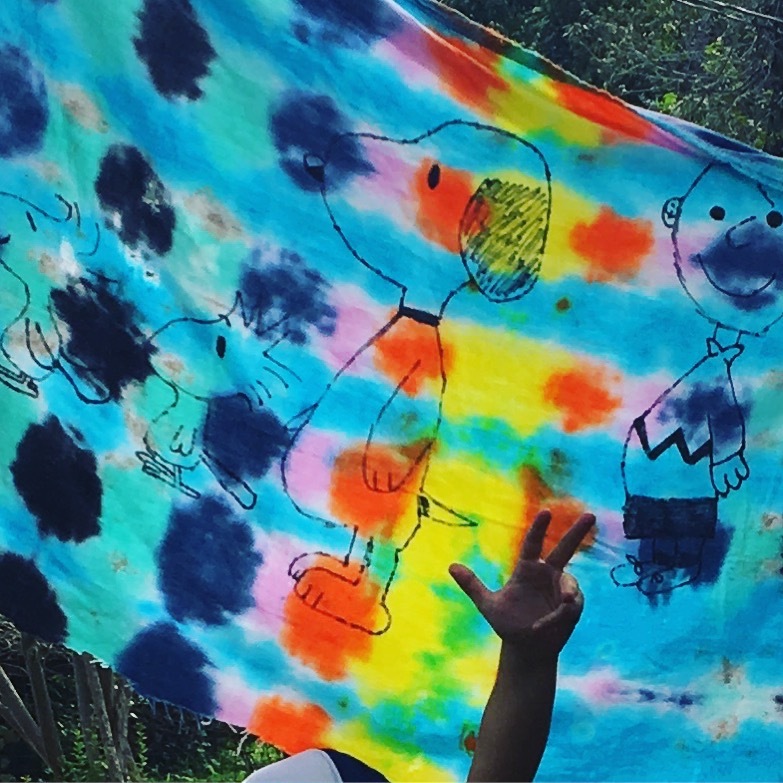 Snoopy tie-die flag complete! Everyone’s welcome on our wacky, wild and wonderful trip around the weirdest town in Texas! All you need is an open mind, a sense of adventure and a fun little guide that will get you where you want to go in the most exciting, kid-friendliest way possible. 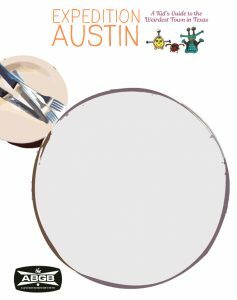 Expedition Austin: A Kid’s Guide to the Weirdest Town in Texas is an adventure (masquerading as a book) designed especially for kids to have a ball in one of the greatest towns to live in or visit in all of Texas, America and maybe even the world. Really! Austin is so great, in fact, that something like 22 million people visit every year and more people move here than almost anywhere else in the country. Whether you’re lucky enough to call Austin home, or one of the millions visiting from some other cool place, this here 120-page guide will give you the stuff you need to turn an ordinary trip around town into something you’ll want to brag about.